I have studied at Swindon New College on a BTEC National Diploma in Performing Arts, as they didn’t offer a technical specific course I ended up doing both tech and performing. After this I had a few years working with live event companies in the Swindon and Bristol areas, and I am now studying an FDA Live Event Production degree at The Backstage Academy in Wakefield, Yorkshire. The course covers everything from staging through lighting, sound and video, even to using 3D modelling programmes. I’m currently working on setting up a live event production company offering services for small events – this is based on a small mobile disco company I had been running over a few years. My aim is to offer lighting, sound video and event production services for University balls, council events, large weddings and dry hire. 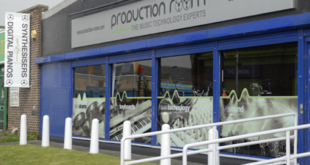 I’m based in Hemsworth, West Yorkshire, where I have regular work with LS-Live rehearsal studio in South Kirkby, and the company’s warehouse. I have recently been working with a local band called The Ashes from the same town filling in as a sound engineer. The last desk I had the pleasure of using was the Yamaha M7CL-48, with a built in Virtual Effect and GEQ Rack, allowing the EQ to be applied up to around 16 channels at once. I haven’t used many digital desks so far in my career and tend to stick with analogue desks. The console was already in place and setup for me as I was asked to fill in for an event and was basically asked to turn up for a rehearsal and then mix for the show, so I never had much of an input in terms of what equipment was being used. My console of choice would have to be either the M7CL or any Soundcraft desk. These two brands have been the best sounding to my ears that I have used, however everyone is different and may disagree with me. If I could tour with a band it would have to be the legendary Iron Maiden, a band I have followed since I was a kid and still do to this day. Also, being a member of local crew on their final frontier tour, I was keen for more of the tour and the great humour of the crew. The great powerful voice of Bruce Dickinson and the skilful bass lines of Steve Harris have always had an impact on the music I listen to and enjoy. And after over 30 years of music and still going strong, they must be doing something right.